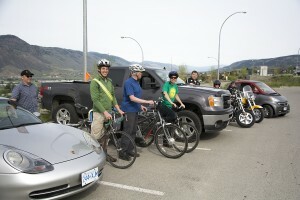 Last year’s Bike to Work Week (BTWW) Kamloops event saw 918 participants form 125 teams who committed to riding their bikes instead of driving for a one-week period. According to their calculations, this saved 5,585 kg of greenhouse gasses, and took 24,072 km of automobile traffic off our community’s streets. Alex de Chantal, City of Kamloops community and wellness events coordinator, kicked off the 2014 event with the traditional “Commuter Challenge” competition on May 12, which pitted local politicians and volunteers against each other to see who could get around town in rush hour traffic in the least amount of time, obeying all rules of the road. Mayor Peter Milobar was in his own truck, and city counsellor Donovan Cavers, one of Kamloops’ best known public transit/bicycling advocates, was, of course on his bike. There was also a Porsche, an electric car, and a couple of Harley Davidson motorcycles. Officially, the seventh annual Kamloops BTWW runs from May 26 to June 1 this year, and includes a free bike-maintenance workshop courtesy The Bicycle Café in Valleyview, and many other fun events that people can get involved in to celebrate sustainable transportation. For more information, check out this link or email event coordinators Krystal Kehoe at krystalkehoe@gmail.com or Marcia Dyck at marcia.a.dyck@gmail.com. Based on his Twitter celebration, Cavers would like everyone to know that he won the Commuter Challenge this year, after finishing third in 2013. Pedal bikes have come in first place in back-to-back events, as well as finishing second this year and third in 2013.